(CNN) -- Although most states saw the number of initial unemployment claims rise last week, 14 saw the number of filings drop, the government said Thursday. 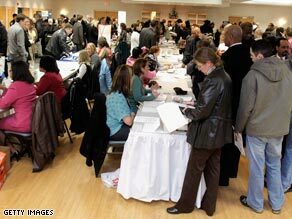 Many job fairs in the United States have become jam-packed events, like this one in Wayne, Michigan. Five of those states -- Missouri, Massachusetts, New Jersey, Florida and New Mexico -- saw claims decrease by more than 1,000, according to U.S. Bureau of Labor Statistics. Across the nation, there are a few companies that are hiring, organizations that are holding job fairs and groups that are bonding to help fellow job seekers with their searches. CNN affiliates are reporting on how those looking for employment are coping with the situation. Brian Jacobson returned from a 15-month tour in Iraq to no job. "Now that I'm out [of the Army], I find it hard because I don't have a set plan day-to-day," Jacobson told CNN affiliate WLS. Though the number of employers was lower than at the inaugural event last year, there were opportunities for job searchers. The Chicago police department was one of the organizations taking applications and résumés. Some service members lost their jobs while overseas. "There's cases where people are laid off even while they're in Afghanistan. We want employers to help put them into new employment," said Dan Grant, director of the Illinois Department of Veterans Affairs. Leslie Truex, who calls herself the Pajama Mom, runs a Web site for people who are looking to telecommute. The woman from Fluvanna County, Virginia, has operated workathomesuccess.com for the past 10 years. She said that when she started the site, she added perhaps one job listing a month. Now it is about five posts per day. Truex told WVIR in Charlottesville that even nursing and tutoring positions are available online. She said the money earned from working online can be helpful in this economy. In the Colorado capital, unemployed workers are gathering in growing number in what are called job clubs. The groups meet at different types of venues, including coffee shops, malls and churches. CNN affiliate KUSA says many clubs have doubled in size in recent months. Many groups include a career counselor who can give tips to job searchers. Several members of one group said the community of people with similar problems and dreams is reassuring. Others enjoy the opportunity to network or just the chance to get out of the house. Pittsburg, California, resident Daniel Nungaray and 244 others finally have jobs. Mi Pueblo Food Center, which specializes in Latin American food products, is set to open this week. In Pittsburg, the unemployment rate is more than 14 percent, and more than 3,600 people applied for work at the supermarket. "It's stressful. It's headaches. [I] can't sleep, can't eat because bills never stop," Nungaray told CNN affiliate KGO. A Mi Pueblo spokesman said grocery stores are solid places to work. One of the other new employees is Jesus Glaz, who had been out of work for six months. He said of the store, "It kind of gives everyone a little bit of hope." Two congregations in the Kansas City, Missouri, area are offering services to the unemployed. At the United Methodist Church of the Resurrection in Leawood, job hunters will find computers they can use, job aides and a book with job listings in it, according to CNN affiliate KSHB. The church also offers a prayer group and a support network. Central United Methodist Church in Kansas City offers similar services, Victoria Kandt said. Craig McKee lost his job in December and decided to start a Web site that combines the concepts of Facebook and job search sites. His Web site, unemployedamerican.com, has 70 members. Victoria Cloud, who lost her job 13 months ago, says the site helps her deal with the isolation she feels. She is glad McKee plans to continue the site even after he lands another job. "I think that's awesome. Networking sites are really useful tools, and I don't see why it couldn't be applied in this sort of situation," Cloud said.